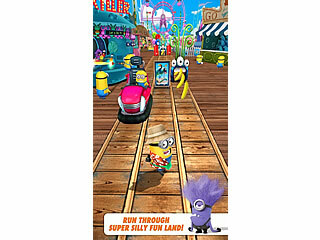 Despicable Me: Minion Rush is a portion of cuteness for your day. These yellow creatures are from the animated Despicable Me movie. The movie fans are going to love the game. Those who have not seen the movie get an extra bonus to go back and watch it. There are quite a few obsticles on your way for the award - cliffs, laser-beams, hazards and other objects. These little yellow guys serve their boss Gru who is the main character of the movie. The game is about the minions of this villain rather than him. They are given a chance to win the Employee of the Month title. You are running for the title as one of them. The game is really colorful and bright. 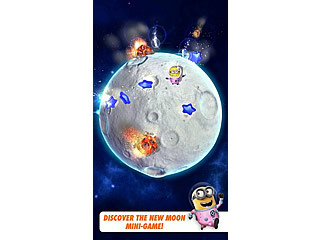 The minions don't talk but make all kinds of sounds that make them so funny and adorable. There are quite a few obsticles on your way for the award - cliffs, laser-beams, hazards and other objects. The angle at which you are looking at is sometimes quite challenging, like a side view of a track. Apart from the race, you will have to deal with Gru's enemy Vector and his little robots every once in a while. You will have to tap onthem and send them back at him. You are okay with paying for everything with bananas, but you can also get good power-ups for the hard currency. I guess it depends of how much you'll love them.